Driving Miss Daisy | Help! I live with my Italian mother in law! It has occurred to me of late how much I take what I’ve learned over the past decade for granted. Like for example, doesn’t everyone know that a pair of socks in your carry-on are a necessary item for overseas flights? 1) While I lived in Grand Cayman, all the locals knew that you shouldn’t swim in the sea between Mother’s day and Father’s day. Why? Because of sea itch of course, then the next question is what the hell is sea itch? Jellyfish eggs that are invisible but get under your skin and itch like hell. 2) You need to separate the two parts of a mocha before washing. Hmmmm, what the heck is a mocha? Well, it’s a mini coffee percolator that makes an espresso coffee. These are common in Italian homes. You add water and then coffee in the metal filter, screw the top half on and place directly on the stove burner. Never screw the parts back together until the mocha is completely dry, otherwise the joints might rust. 3) Gas is cheaper than electricity because Italy buys its power from France. I have an electric hot water boiler for showers but I boil water on the gas stove to wash my dishes…archaic, yes, but saves money. 4) Learn to master at least one skill that impresses the heck out of everyone. While it is pretty clear that I will never win awards for my culinary or singing skills, I have gained impressive praise for my driving skills. I can parallel park my rusty Panda in thirty seconds…let me paint a picture for you. Manual gears, pedals as small and narrow as a toothpick, no power steering or for that matter power anything! I can take her through narrow passageways with stone walls towering on both sides and only a mere inch on each side in a curve. A least I’ve mastered a useful skill in all my 47 years of fun! Ironically, I still have to write the Italian driver’s exam, hahaha. 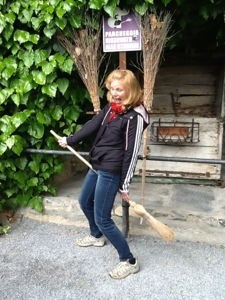 Just think…back in the day, I would have been one hell of a cool witch flying on my broom! This entry was posted in Italian Culture, Tourists, travel and tagged cooking, driving, singing, tips, travel. Bookmark the permalink. Ha! I still need to take my license here in Italy. I’m afraid, very afraid! They never let me bring my own broom through Customs.